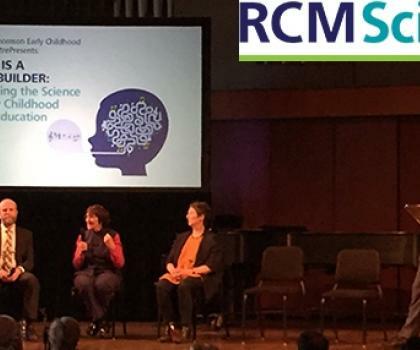 The first-annual Marilyn Thomson Centre for Early Childhood Education Science Symposium was held on Sunday at The Royal Conservatory. Some of the top neuroscientists in the world (all Canadian!) discussed their work on early childhood music education, interspersed with performances from RCM students. It was a full house, and we were glad to see so many people interested in music and neuroscience! The event started with an introduction from yours truly, discussing some of the unique benefits of having a research lab inside a conservatory, and going over some of our recent findings seen among children in our Smart Start courses including that they show significant improvement in vocabulary and pre-reading skills over the course of the year. After a performance from children in The Royal Conservatory School’s Early Childhood Ensemble, we heard from Dr. Sandra Trehub, professor emeritus at University of Toronto Mississauga and expert in infant musical behaviour. Dr. Trehub gave an engaging talk all about the social and emotional benefits of singing to infants, and highlighted the special importance of a mother’s voice to her child, with some riveting cross-cultural videos that showed the calming effect of infant-directed singing. We then enjoyed performances from talented young musicians from The Phil and Eli Taylor Performance Academy for Young Artists. Dr. Virginia Penhune, from Concordia University in Montreal then spoke about her work on the role of early music training, and the differences we can see between musicians who started early vs. late. Her talk pointed out both differences in behaviour and differences in the brain, and highlighted the importance of both starting early and continuing on with musical training. We then had our last musical performance of the day, by Quintagious!, showcasing students from The Glenn Gould School . Our last speaker was Dr. Benjamin Zendel, from Memorial University in Newfoundland. Dr. Zendel spoke about the other end of the developmental spectrum, and considered the role that musical training can play as we age. His work pointed out the differences between hearing abilities in non-musicians and older musicians (who had generally started in their youth). Dr. Zendel then went on to show some new evidence that it’s never too late to enjoy the benefits of playing, and even older non-musicians could gain some benefits from learning a musical instrument. For our last 15 minutes we invited the scientists back on stage for an engaging Q&A with the audience. We had lots of questions on a variety of topics -- a sure sign that this is an area of widespread interest! The Marilyn Thomson Early Childhood Education Centre Science Symposium is intended to be an annual event, so follow #RCMScience to be the first to hear about our next symposium! What topics would you like us to cover in a future event? Give your suggestions in the comments below.